It has been suggested that Passio sanctorum Petri et Pauli be merged into this article. (Discuss) Proposed since July 2018. The Acts of Peter and Paul is a 4th century Christian text of the genre Acts of the Apostles. An alternate version exists, known as the Passion of Peter and Paul, with variances in the introductory part of the text. The text is framed as the tale of Paul's journey from the island of Gaudomeleta to Rome. It assigns Peter as Paul's brother. It also describes the death of Paul by beheading, an early church tradition. The text also contains a letter purporting to be from Pilate, known as Acts of Pilate. The work appears to have been based on the Acts of Peter, with the addition of Paul's presence where before it was only Peter's. The work is dated to around 450 to 550. Latin as well as and Greek versions survive, with the latter usually being longer. The Latin versions sometimes end with "I, Marcellus, have written what I saw." This Marcellus is identified as a disciple of Simon Magus, who lived in the 1st century. Because of this obvious anachronism, since the text is clearly written centuries later, scholars have dubbed him Pseudo-Marcellus. ^ Schmisek, Brian (2017). The Rome of Peter and Paul: A Pilgrim's Handbook to New Testament Sites in the Eternal City. Wipf and Stock Publishers. p. 18. ISBN 9781532613098. Retrieved 19 July 2018. Tajra, H.W. (1994). 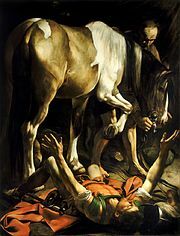 The Martyrdom of St. Paul: Historical and Judicial Context, Traditions, and Legends. 2]. J.C.B. Mohr. p. 144ff. ISBN 978-3-16-146239-9. Retrieved 29 June 2018.